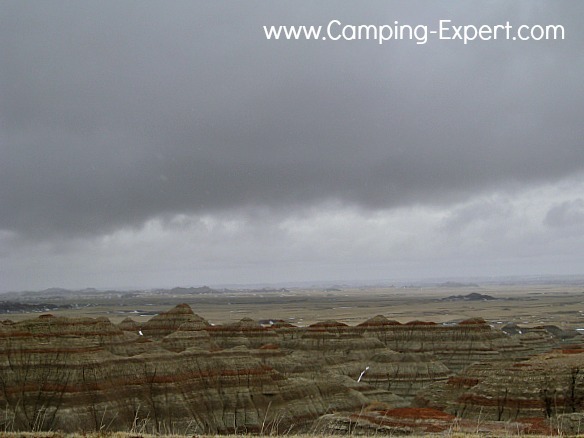 Badlands National Park are a great (not bad) park with neat geologic, historic and natural significance. Learn more about them, with neat pictures. I had the pleasure to drive through the Badlands right before a winter storm in April. Although this isn’t the best way to experience any location, I still thoroughly enjoyed it. 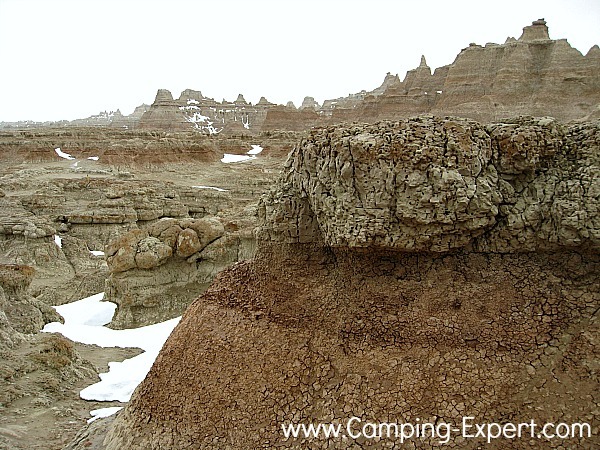 The badlands have a long history, dating back to the Eocene (40-55 million years ago) and Oligocene (25-40 million years ago) mammal fossils. Most people think of fossils as dinosaurs, but these were mostly mammal fossils. Some of the animals that once roamed there included 3 toed horses, rhinos, deer like aniamls, rabbits, tortoises, birds, and beavers. The visitor centre has some very neat fossils, and life-size animal figures, so you can see what it was like back in the day. Then, in the more recent history, Natives used the area for hunting as far back as 11 thousand year ago. At this time the land was a great hunting location. In the 19th century, disputes between the US government, and the local natives led to the Wounded Knee Massacre on the Badlands park area. Fossils have been collected here since the natives lived in the area. They knew that the bones came from animals that no longer lived. Palentoligoists continue to study the fossils at the Badlands. 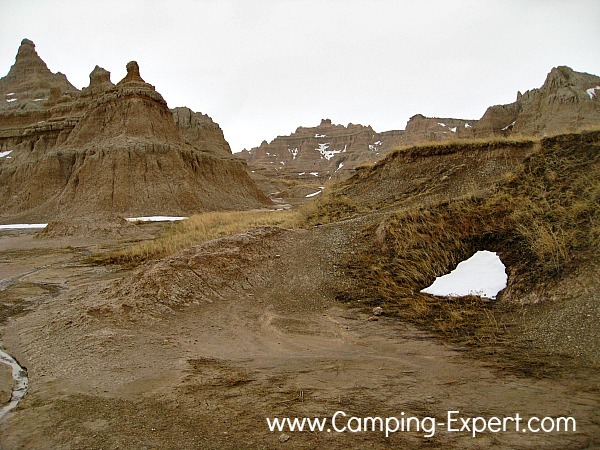 The Badlanda are also an interesting location geologically speaking. The different layers and colours of the rock formations were deposited at different times, and so you can actually tell when the animals roamed millions of years ago. These layers make it easy to follow the history of the land over the years. To describe the location, I would best describe it as a cross between the Grand Canyon and Bryce Canyon national park. 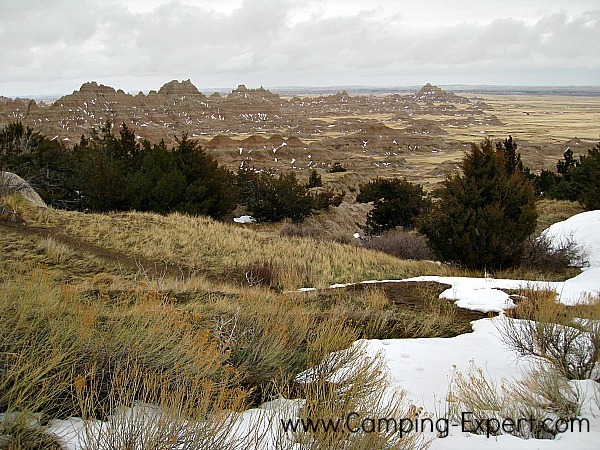 There are several trails that you can take in the Badlands. If you decide to hike during a rainy time, you must make sure that you take a boardwalk trail, as the mud will get VERY slippery, and with the hills taking you down into the Badlands, you will not want to be slipping. The soil is clay-y and so is very slippery. The Badlands are pretty neat, and if you are into fossils, history or geology, then I would highly recommend visiting them. I thoroughly enjoyed the neat geologic formations of the rocks plus, I even saw some neat wildlife. 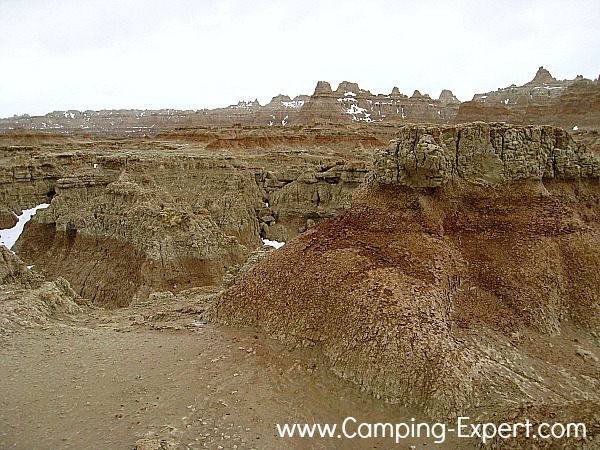 Check out other Camping Locations and Parks that I’ve visited.